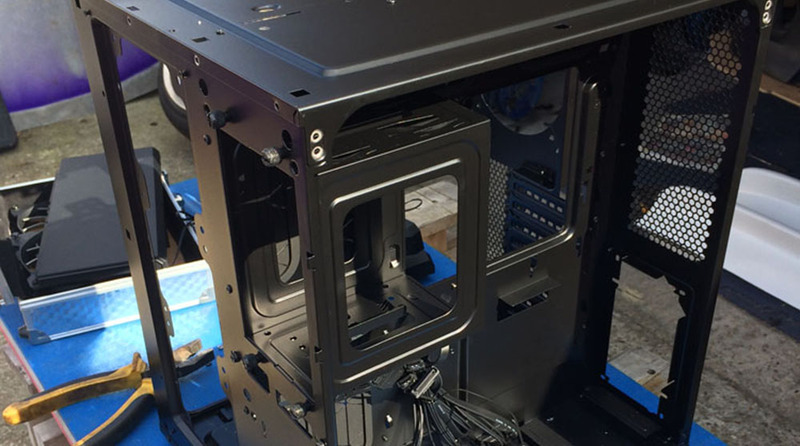 Bravr CEO Shahin Fard is building a custom water cooled PC. The aim is to build a workstation using a custom Corsair Carbide 540 and three UHD displays. In part 3 of his blog series, he explores stripping down the case. I’ve looked around at the custom PC builds and simply throwing some radiators in and using a rattle can doesn’t really cut it by today’s “modders” standards. This is the second custom PC I’ve ever built so time to increase the difficultly somewhat. The first step was to strip the case down to its bare essentials to see what we had to work with. The case was stripped down using a drill and cone cutter. My first impression is that Corsair build robust cases with a lot of pop rivets. I’ve always been impressed with the quality of Corsair cases and they’ve come along way from just selling memory. What I discovered was that the roof panel and base panel were very similar. This gave me the idea that if I had a second Corsair Carbide Air 540 case (which I happened to have in case this build went wrong) ,then I would be able to attach a roof panel to the base of the case. This would give me room for a third radiator with a nice grill. The only issue with this approach is the plastic panels do not line up. However this isn’t really a problem as it effects the base and as such will be at the bottom of the case. I thought about extening the panel using a mixture of trims, fibreglass, and filler, however due to the complexity it really wasn’t worth if for the matter of a slight improvement in aesthetics. The next step is to test fit the radiators and get the case painted!